The Platform Imperative has never been more critical than now, when The Internet of Things (IoT) is making the lives of consumers more secure, convenient and affordable. The number of data sources and business models seem potentially endless and the insurance industry needs to know how to approach this uncertain, emerging area of data and technology. 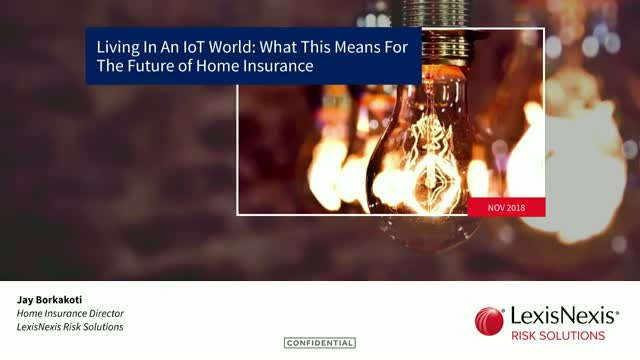 In this session, we will review a day in the life of a connected consumer at home and draw conclusions on the multiple ways insurance providers can benefit from such connectivity through a device and market agnostic approach to insurance. In this 45 minute webinar, we will discuss how and why LexisNexis Risk Solutions is integrating UBI (Usage Based Insurance) and ADAS (Advanced Driver Assist Systems) data into its global telematics platform. We will look at the current focus for auto manufacturers and share key learnings on where the industry is headed. Join this session as we examine UBI and ADAS data and how the roadmap to autonomy can allow insurance providers to take advantage of the data today, while positioning a brand for the future. Gain an understanding of what UBI and ADAS data is and how it can be beneficial to insurance providers. Discuss the current business focus for auto manufacturers and where they hope to be in the future. Establish how auto manufacturers and insurance providers can work together using roadmap to autonomy. Understand how insurance providers can take advantage of the data available in the market today in order to build a brand for the future. This webinar has been designed to provide an overview of the Education Outreach Programme vision, to train on the use of the Discover Fortunes board game, to cover some points on engaging with schools and students and to understand the Personal Finance Society guidelines. Discover Fortunes marks the starting point of the financial conversation with students in schools with follow-up resources focusing on financial education that will be released for use. Estimated webinar duration: 60 minutes.. This 45 minute webinar is the third in a series of webinars on cyber and digital topics jointly hosted by the CII, CILA, IRM, IIL and Airmic to raise broad knowledge of technical advances and how they affect our customers. The objective of the webinar is to reflect on these ethical frameworks to identify the key issues that arise as a result of new and potential technological advances that could lead firms or practitioners to conflict with ethical good practice. This is a panel debate and there will be the opportunity to take audience questions at the end of the webinar. Technology is empowering financial advice firms to reach more clients by reducing friction in the advice process, saving advisers and their support staff time. What we are seeing from an in-depth study of users of Intelligent Office is that those firms which are utilising the technology available to them, are actively servicing more clients, generating more revenue and reaching a younger market than their peers. The top performing firms are generating 15% more recurring revenue than the rest, equating to some £112,000 per annum, by servicing an extra 131 clients. The good news is that the tools to fundamentally boost your business metrics are available now. Rob Walton, Chief Operating Officer, Intelliflo will discuss this in further detail during this 60 minute webinar. This is the second of our Cyber webinars run in partnership with the Institute of Risk Management, the Chartered Institute of Loss Adjusters, Airmic and the Insurance Institute of London. In this panel interview, cyber experts from across broking, risk management and loss adjusting will outline the risk story of cyber enabled fraud from underlying risk, client guidance and coverage considerations to claims settlement. The implementation of the Payment Services Directive 2 in January this year (allowing non-banks to provide payment services) and the advent of open banking will also no doubt change the landscape for funds transfer and other cyber enabled fraud. • Monica Dawson QIAL, CMIIA, SIRM will identify the key steps that organisations should follow to prevent them from becoming a victim of cyber enabled fraud. The session will end with the opportunity to pose questions to the panel. The professional body for the global the financial planning profession, the Chartered Insurance Institute (CII) promotes higher standards of integrity, technical competence and business capability. With 125,000 members in 150 countries, the CII is dedicated to insurance and financial planning. Our membership covers all disciplines within the insurance industry (claims, broking, underwriting and sales), those working in the life and pensions sector and the mortgage advice market as well as independent financial advisers (under our sub-brand the Personal Finance Society). The CII is accredited by UK examinations regulator, Ofqual, and our qualifications are also recognised within the English national qualification frameworks. Success in CII qualifications is universally recognised as evidence of knowledge and understanding. Membership of the CII signals a desire to develop broad professional capability and to subscribe to the standards associated with professional status. Our Royal Charter remit is 'to secure and justify the confidence of the public'​ in our members and in the insurance and financial services sector.